From the Department of Neurology (S.-M.K., J.-S.K., K.S.P., K.-W.L.) and Ophthalmology (S.-J.K.), Seoul National University College of Medicine, Seoul, Republic of Korea; Nuffield Department of Clinical Neurosciences (M.R.W., A.V., P.W. ), John Radcliffe Hospital, Oxford, United Kingdom; and Department of Neurology (K.S.P. ), Seoul National University Bundang Hospital, Gyeonggi, Republic of Korea. Objective: To evaluate the clinical relevance of myelin oligodendrocyte glycoprotein antibody (MOG-Ab) in a cohort of adults with inflammatory demyelinating disease (IDD) of the CNS. Methods: Live cell-based assays for MOG-Ab (IgG1 subset) and antibody to aquaporin-4 (AQP4-Ab) were performed in a cohort of 270 adult patients with IDD and 72 controls. Patients were first grouped by positive antibody result as MOG-Ab or AQP4-Ab, and the remainder were grouped by published diagnostic criteria. Results: Seventeen patients with IDD (6.3%) had MOG-Abs and 49 patients (18.1%) had AQP4-Abs; none had both antibodies. The MOG-Ab patients predominantly manifested with isolated symptoms of optic neuritis (83%). One-third of these patients experienced relapses, which involved only the optic nerve, and all relapsed within 1 year of disease onset. At onset, MRI in the MOG-Ab group uniquely demonstrated perineural enhancement, extending to the soft tissues around the optic nerves (33%). Although about 30% of MOG-Ab patients had brain MRI lesions, they had fewer periventricular lesions than the 26 patients with relapsing-remitting multiple sclerosis (MS); none of these lesions were ovoid or perpendicular to the ventricle. Moreover, MOG-Ab patients did not meet the diagnostic criteria for definite neuromyelitis optica (NMO) and had less spinal cord involvement than the AQP4-Ab group. Four patients (23.5%) had poor visual outcomes (<0.2) or paraplegia. Conclusions: MOG-Abs may be a disease-specific biomarker in adult patients with IDD who have a disease distinct from NMO or MS. The radiologic as well as clinical manifestations of MOG-Ab patients can be useful in their differential diagnosis. Several recent studies have shown the presence of myelin oligodendrocyte glycoprotein antibody (MOG-Ab) in the serum of adult patients with the NMOSD phenotype.10,11 However, the clinical relevance of MOG-Abs among adult patients with IDD is not yet clear.12 In this study, a large number of sera from adults with IDD and controls were tested for antibodies to MOG and AQP4 by cell-based assays.13 The clinical features of patients with MOG-Abs are described and compared to those of patients with AQP4-Abs or MS. The study population (IDD group) consisted of 270 consecutive patients with IDD who were suspected of having MS,1 definite NMO2 or clinical features of NMOSD,7 ADEM,3 clinically isolated syndrome (CIS),14 ATM,5 or ON.15 This study also included 72 controls with noninflammatory diseases, including tumors (n = 15), vascular disease (n = 11), peripheral neuropathy (n = 7), encephalitis (n = 5), metabolic disease (n = 5), ocular disease (n = 5), degenerative spinal disease (n = 5), hereditary disease (n = 4), infection (n = 3), psychogenic problems (n = 3), motor neuron disease (n = 2), and others (n = 7). All patients were older than 16 years16 and visited Seoul National University Hospital MS/NMO Clinic (IDD group) or Neurology Clinic (control group) between November 2010 and October 2013. All patients were followed for more than 6 months. Assay for AQP4-Ab and MOG-Ab. Samples were immediately centrifuged, stored at −80°C according to the standard protocols,16 and shipped on dry ice to the John Radcliffe Hospital, Oxford, UK. Only serial study numbers and initials of the patients were provided, and the diagnoses and epidemiologic data were unknown to the testing personnel (M.R.W., P.W.). The samples were analyzed for binding to AQP417 and MOG13 using cell-based assays. Antibodies to full-length MOG were detected with anti-human IgG1. Patients were grouped based on antibody test results as the MOG group, AQP4 group, double-positive group, or seronegative group (figure e-1 at Neurology.org/nn). In the seronegative group, those meeting the international panel criteria for relapsing-remitting MS1 were further classified as the MS group. Patients were also classified according to diagnostic criteria for definite NMO,2 ADEM,3 ATM,5 or ON.15 Two neurologists (S.-M.K. and J.-S.K.) independently assessed the diagnoses of the patients according to their symptoms and published criteria.1,–,3,5,15 For any diagnostic disagreement, discussion and reassessment of the medical record were made to achieve consensus. Comparison of the clinical, radiologic, and prognostic characteristics. Epidemiologic data, frequency of attacks, involved structures, patterns of MRI abnormalities, CSF analysis, disability and severity, response to treatment, and disease courses were assessed blinded to the antibody status. The frequency of attack was measured only in patients who were followed for more than a year. Maximal Kurtzke Extended Disability Status Scale (EDSS) score18 at the nadir of disease and at last follow-up were assessed. A perineural enhancement pattern of the optic nerve was defined as an extensive enhancement pattern that was not limited to the optic nerve but extended to the soft tissues of the orbit. A relapse was defined as an episode of a new neurologic deficit that lasted at least 24 hours and occurred more than 1 month apart from a previous attack. An exacerbation was defined as an aggravation in the symptoms of a previous attack that lasted at least 24 hours, followed a period of nadir or recovery of a previous attack, was not attributable to fever or fatigue, and occurred within 1 month from the onset of a previous attack. A steroid-dependent relapse or exacerbation was defined as a relapse or exacerbation that occurred within 1 month from the cessation or dose reduction of oral steroid. The Kruskal-Wallis test followed by pairwise comparison, or one-way analysis of variance followed by Tukey test were performed to compare the clinical characteristics between the MOG-Ab, AQP4-Ab, and MS groups. The significance level was set at p < 0.05. Analyses were performed using SPSS software (version 22; SPSS, Chicago, IL). The study was approved by the Seoul National University Hospital Institutional Review Board (approval number: H-1012-080-344). All patients provided written informed consent before participating. Classification of patients and frequencies of MOG-Ab and AQP4-Ab. 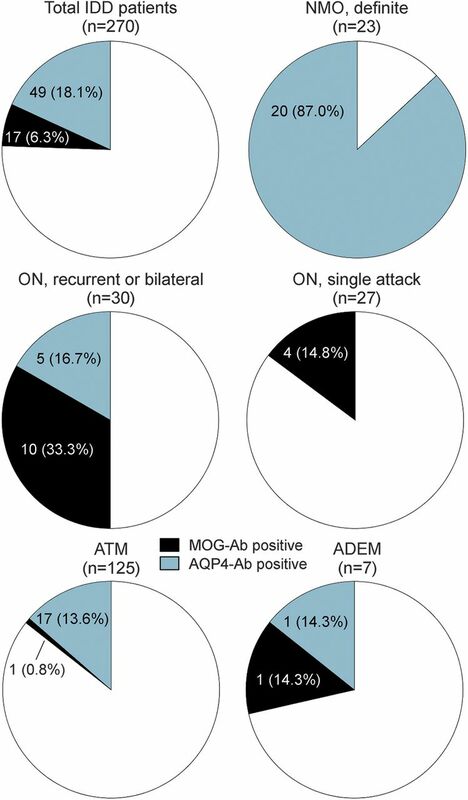 MOG-Abs were most frequent in patients with recurrent or bilateral ON (10/30; 33.3%) or those with a single ON attack (4/27; 14.8%), whereas only 1/125 patients with ATM (0.8%), 1/7 with ADEM (14.3%), and none with definite NMO (n = 23) had MOG-Abs. AQP4-Ab positivity was found in patients with definite NMO (20/23; 87.0%) but also in patients with recurrent or bilateral ON (5/30; 16.7%), ADEM (1/7; 14.3%), or ATM (17/125; 13.6%). The assay results are summarized in figure e-1, and the proportion of each disease group with MOG- and AQP4-Abs is shown in figure 1. Overall, 6.3% of patients with inflammatory demyelinating disease were myelin oligodendrocyte glycoprotein antibody (MOG-Ab) positive (black) and 18.1% were aquaporin-4 antibody (AQP4-Ab) positive (blue). The majority of MOG patients had optic neuritis (ON), whereas the majority of AQP4 patients had either neuromyelitis optica (NMO) or acute transverse myelitis (ATM). Just over 50% of patients with recurrent or bilateral ON were antibody-positive. ADEM = acute disseminated encephalomyelitis. Characteristics of IDD patients with MOG-Ab. The most common symptomatic clinical manifestation in the MOG group was isolated ON (83.3%; table 1). Although most of these cases with isolated ON were recurrent or bilaterally simultaneous/consecutive, 4 of them manifested as a single attack of unilateral ON. The visual acuity (VA) was severely affected at nadir, with VA less than or equal to 0.2 in 75% (9/12) of patients. Perineural enhancement that extended around the soft tissue of the optic nerve, visualized by MRI, was found in 33% of patients in the MOG group (table 1 and figure 2). This pattern of orbital inflammation was more prominent in their first ON attacks than in subsequent ON attacks (data not shown). Brain MRI abnormalities were found in only 5 (29%) of these patients, and they were asymptomatic in 3 cases (figures 3 and 4). They tended to be large (>3 cm) and involve white matter and the internal capsule (figure 3, A and B); in some cases, they mimicked the lesions of posterior reversible encephalopathy (figure 3, C and D). There were also symmetric brainstem lesions involving pontine tegmentum (figure 3, E–G). There were no ovoid lesions or lesions perpendicular to the ventricles as typically found in MS. One-third of myelin oligodendrocyte glycoprotein antibody–positive patients revealed extensive enhancement patterns that were not confined to the optic nerve but extended to the soft tissues around the optic nerves (perineural enhancement) (A–D), which were not observed in the neuromyelitis optica group (E and F) or the multiple sclerosis group (G and H). All MRIs were T1-weighted with gadolinium enhancement. Red lines in A, C, E, and G highlight the level where the transverse images in B, D, F, and H are taken. Extensive brain lesions with large diameter (A and B), posterior reversible encephalopathy–like lesions (C and D), and symmetric brainstem lesions involving pontine tegmentum (E–G) were found in the myelin oligodendrocyte glycoprotein antibody (MOG-Ab) group. A, C, D, F, and G = fluid-attenuated inversion recovery; B = T2-weighted image; E = double inversion recovery. Five myelin oligodendrocyte glycoprotein antibody (MOG-Ab)–positive patients experienced a relapse, all of which manifested as optic neuritis (ON). All patients with a relapsing disease course experienced a relapse within the first year of disease onset. Blue bar represents treatment period for relapse prevention. Only 2 MOG-Ab patients (11%) had spinal cord involvement, but the lesions were very long (8–9 continuous vertebral segments). MOG-Ab patients with poor outcomes. Although MOG-Ab patients have previously been shown to have a generally good recovery,10 4 of our 17 patients had severe sequelae, 3 from their first attack. Patient 6 had severe bilateral ON, causing VA of 0.02 in the better eye. Although her VA improved after steroid treatment, it remains poor (0.15) after recovery. Patient 11 was initially misdiagnosed as having ischemic optic neuropathy and hence was not treated with steroids or plasmapheresis; she was referred to us after several months but was left with a poor VA of less than 0.2 bilaterally. Patient 17 became completely paraplegic after the first attack of longitudinally extensive myelitis, which involved the conus medullaris. Aggressive acute-phase treatment, including high-dose methylprednisolone, plasmapheresis, and cyclophosphamide, was given, but he remains wheelchair-dependent nearly 4 years later. Patient 1 experienced 5 attacks of ON within 2 years of onset, which led to a confirmed VA of only hand motion perception in the right eye despite treatment with azathioprine and oral prednisolone. He was switched to rituximab to prevent further relapses and further loss of vision in the left eye and has been relapse free for 7 months (table e-1 and figure 4). Comparison of the clinical, radiologic, and prognostic characteristics between groups. There was no difference in patient age at onset, but the well-recognized female predominance in AQP4 patients is reproduced here (table 1). ON was more common in MOG-Ab patients than in the other 2 groups, and perineural enhancement of the optic nerve was found only in MOG-Ab patients. They also had fewer relapses and were more likely to have a monophasic disease course (no relapse within 2 years). All 11 relapses in the 5 relapsing patients with MOG-Abs involved only the optic nerve, and 4 of 5 made an excellent recovery. In contrast, there was significantly more brain or spinal cord involvement in relapses in the other 2 groups (87.0% in the MS group, 86.7% in the AQP4 group). On brain MRI, the MOG group had fewer brain abnormalities, fewer periventricular lesions, and fewer ovoid lesions perpendicular to the ventricle than the MS group. Surprisingly, none of the MOG group met the 2006 Wingerchuk criteria for NMO, and the MOG group had fewer patients with spinal cord involvement than the AQP4 group. However, there was no difference in the number of relapses during the onset year in the 3 groups, no difference in onset EDSS between MOG-Ab patients and those with MS or AQP4-Ab (table 1), and no difference in the number of patients who had an EDSS score ≥6 at onset or at the last follow-up. The severe disability in the MOG group resulted from the initial attack in 3 of 4 cases (table e-1). The MOG group had a relatively short mean follow-up time of 3 years, but fewer patients in this group received any treatment (5/17; 29.4%) compared to the AQP4 (43/49; 96.2%) and MS groups (25/26; 96.2%). The potential significance of MOG-Abs, measured against full-length MOG expressed in human cells, is only just beginning to be appreciated. In adult patients with IDD, these antibodies have been reported in a proportion of AQP4-Ab-negative patients with clinical features of NMOSDs.10,11 However, there are still concerns about the ability of MOG serostatus to distinguish between MS and non-MS conditions and double-positive patients. In this unselected study of 270 adult patients with IDD, just over 6% had IgG1 MOG-Abs, another 18.1% had AQP4-Abs, and none had both antibodies. Patients with MOG-Abs had a disease distinct from MS and NMO that is highlighted by differences in clinical manifestations, radiologic findings, treatment responses, and prognosis. Although the MOG-Abs seem to define a disease with a generally good prognosis, some patients (4/17; 23.5%) were left with severe functional impairments, including complete paraplegia. The IDD patients with MOG-Abs presented more often with ON, more frequently manifested with symptoms of isolated ON (83%), and had a more monophasic course (71%) than those in the MS and AQP4-Ab groups. Particularly striking was the perineural enhancement of the optic nerve that extended to the soft tissues around the optic nerve, which was not observed in the MS or AQP4 groups and which was most evident in the first attack. Steroid-dependent relapses or exacerbations were found in 20% of patients in the MOG group but not in the MS group. All patients with MS had brain lesions (38% had ovoid lesions perpendicular to the ventricles) compared to less than half of the MOG patients, none of whom had MS-typical brain lesions19 but instead had large-diameter lesions or symmetric brainstem lesions involving the pontine tegmentum. Although spinal cord lesions were less common in the MOG group, the lesions in 2 patients were very extensive. There were also differences between MOG-Ab and AQP4-Ab patients. MOG-Ab patients did not meet the revised criteria for definite NMO.10,11,2 In agreement with previous studies, we highlight the strong predilection of MOG-Abs for the optic nerve and less so for the spinal cord, unlike AQP4-Abs, which show opposite preferences (table 1). Recently, 2 important studies have described the clinical characteristics of adult patients with MOG-Abs.10,11 However, both of these studies aimed to characterize the features of NMOSD patients with MOG-Abs compared to those with AQP4-Abs in a cohort limited to patients with clinical features of NMOSDs.10,11 In this study we evaluated the clinical relevance of MOG-Abs in a large number of consecutive adults with IDD and identified some important radiologic features of MOG-Ab patients, including perineural enhancement patterns around the optic nerve and patterns of brain lesions. These findings suggest that adult IDD with MOG-Abs is a separate entity from NMO and MS. This study has some limitations. Although the cohort screened was large, the number of MOG-Ab patients was relatively small. The average follow-up period of 3 years for the MOG group is short. The percentage of relapse-free MOG-Ab-positive patients is similar to previously published work,10 but only longer follow-up will tell whether the relapse-free patients (72%) remain so. Nevertheless, it now seems clear that MOG-Abs are a biomarker for adult patients with IDD that have distinct serologic, clinical, and radiologic features from patients with MS or AQP4-Ab patients, suggesting that MOG-Abs might mediate a distinct disease. Sung-Min Kim drafted the manuscript, designed the study, performed statistical analysis, and analyzed the data. Mark R. Woodhall, Ji-Sun Kim, and Seong-Joon Kim contributed to the acquisition of data. Kyung Seok Park contributed to patient and data recruiting. Angela Vincent revised the manuscript and was involved in study design. Kwang-Woo Lee contributed to patient and data recruiting. Patrick Waters drafted the manuscript, designed the study, confirmed the statistical analysis, and analyzed the data. P. Waters, A. Vincent, and M. R. Woodhall are supported by NHS National Specialised Commissioning Group for Neuromyelitis Optica, United Kingdom, and by the NIHR Oxford Biomedical Research Centre. This work is supported by Grant No. A121118 from the Korea Health Industry Development Institute Research Fund and 03-2015-1284 SNUH Research Fund. S.-M. Kim received research support from the Korea Health Industry Development Institute Research Fund and SNUH Research fund. M.R. Woodhall, J.-S. Kim, S.-J. Kim, and K.S. Park report no disclosures. A. Vincent is on the editorial board for Neurology; was an Associate Editor for Brain; holds patents with Oxford University for LGI1/CASPR2 antibodies, licensed to Euroimmun AG, and for GABAAR antibodies, in negotiation with Euroimmun AG; receives royalties from Athena Diagnositcs, Euroimmun AG, Blackwell Publishing, and Mac Keith Press; consulted for Athena Diagnostics; and received research support from NIHR. K.-W. Lee reports no disclosures. P. Waters received speaker honoraria from Biogen Idec Japan and Euroimmun AG, is a review editor for Frontiers in Molecular Innate Immunity, and holds a patent for assays for the detection of antibodies to lgi1, Caspr2, Tag-1, and GABAAR. Go to Neurology.org/nn for full disclosure forms. Accepted in final form August 21, 2015.
. 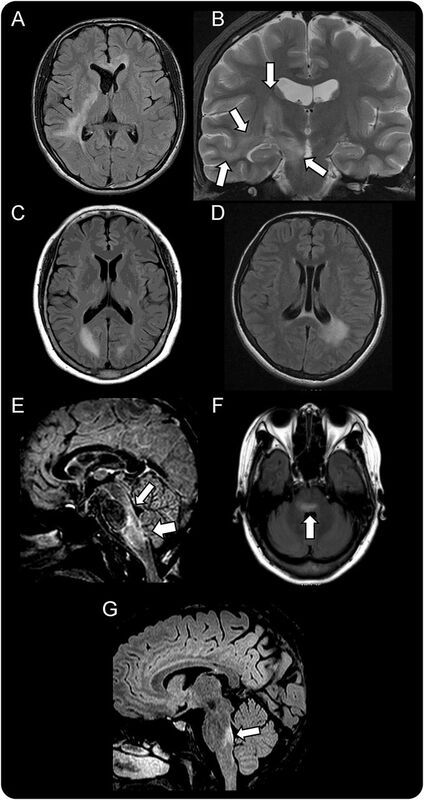 Acute fulminant demyelinating disease: a descriptive study of 60 patients. Arch Neurol 2007;64:1426–1432.
. Optic neuritis: a review. Int MS J 2009;16:82–89. Transverse Myelitis Consortium Working Group. Proposed diagnostic criteria and nosology of acute transverse myelitis. Neurology 2002;59:499–505.
. A serum autoantibody marker of neuromyelitis optica: distinction from multiple sclerosis. Lancet 2004;364:2106–2112.
. The spectrum of neuromyelitis optica. Lancet Neurol 2007;6:805–815.
. Utility of aquaporin-4 antibody assay in patients with neuromyelitis optica spectrum disorders. Mult Scler 2013;19:1060–1067.
. Treatment of neuromyelitis optica: state-of-the-art and emerging therapies. Nat Rev Neurol 2014;10:493–506.
. Distinction between MOG antibody-positive and AQP4 antibody-positive NMO spectrum disorders. Neurology 2014;82:474–481.
. Neuromyelitis optica spectrum disorders with aquaporin-4 and myelin-oligodendrocyte glycoprotein antibodies: a comparative study. JAMA Neurol 2014;71:276–283.
. The spectrum of MOG autoantibody-associated demyelinating diseases. Nat Rev Neurol 2013;9:455–461.
. MOG cell-based assay detects non-MS patients with inflammatory neurologic disease. Neurol Neuroimmunol Neuroinflamm 2015;2:e89. 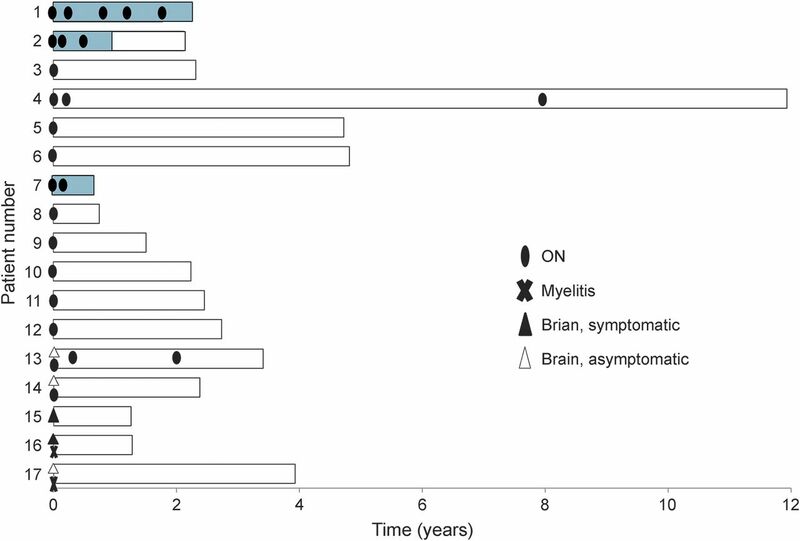 doi: 10.1212/NXI.0000000000000089.
. Clinically isolated syndromes suggestive of multiple sclerosis, part I: natural history, pathogenesis, diagnosis, and prognosis. Lancet Neurol 2005;4:281–288.
. A randomized, controlled trial of corticosteroids in the treatment of acute optic neuritis. The Optic Neuritis Study Group. N Engl J Med 1992;326:581–588.
. A consensus protocol for the standardization of cerebrospinal fluid collection and biobanking. Neurology 2009;73:1914–1922.
. Characterization of the spectrum of Korean inflammatory demyelinating diseases according to the diagnostic criteria and AQP4-Ab status. BMC Neurol 2014;14:93. doi: 10.1186/1471-2377-14-93.
. 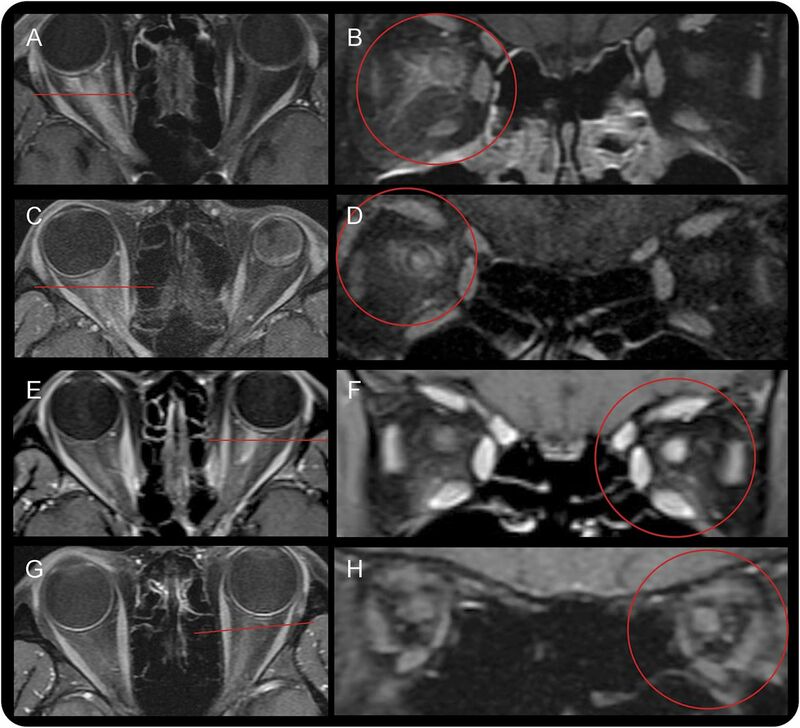 The ovoid lesion: a new MR observation in patients with multiple sclerosis. AJNR Am J Neuroradiol 1989;10:303–305.
. Anti-MOG antibodies plead against MS diagnosis in an Acquired Demyelinating Syndromes cohort. Mult Scler Epub 2015 Feb 6.
. Antibodies to native myelin oligodendrocyte glycoprotein in children with inflammatory demyelinating central nervous system disease. Ann Neurol 2009;66:833–842.
. Highly reactive anti-myelin oligodendrocyte glycoprotein antibodies differentiate demyelinating diseases from viral encephalitis in children. Mult Scler 2011;17:297–302.
. Acute disseminated encephalomyelitis: current understanding and controversies. Semin Neurol 2008;28:84–94.